Snarling and spitting, this small figure looks like a hateful old man, his face wrinkled like month-old fruit. 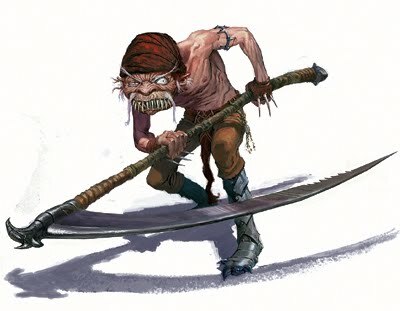 the bent, three-foot-tall cretin wields a scythe nearly double his size in his gnarled hands, and wears a pair of overly large spiked iron boots. Upon his grizzled head sits a bent hat, gruesomely stained bright crimson. Boot Stomp: 1d6 counts as spring attack. Tactics Lone redcaps try to wear down their opponents by using their boot stomp ability to make a series of hit-and-run attacks. Groups, however, are much more bold, swarming larger foes and slicing them to shreds with their terrible scythes. Bloodthirsty creatures, redcaps fight until they are barely able, fleeing only if reduced below 5 hit points. A redcap wears a tiny, shapeless woolen hat, dyed over and over with the blood of its victims. While wearing its cap, a redcap gains a +4 bonus on damage rolls and fast healing 3 (reflected above). These benefits are lost if the cap is removed or destroyed, and caps are not transferable, even between redcaps. A redcap can create a new cap to replace a lost cap with 10 minutes of work, although until the redcap can take a standard action to dip the cap in the blood of a foe the recap helped kill, it does not grant its bonuses. Removing a red caps hat makes it staggered and slowed. The redcap must make a DC 15 Will save or will not do anything but try to retrieve its cap. Destroying a redcaps hat will cause to be stunned for 1d4 rounds as it howls in agony.